The Language and Literature Section of the Institute of Valencian Studies publishes the work of its member Antoni Fontelles Fontestad. 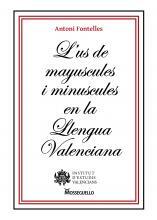 This work, entitled L'us de les mayuscules i minuscules en la llengua valenciana, is a linguistic study that deals with how Valencians should use uppercase and lowercase letters in the Valencian language. In the publications section, the complete work is available for anyone interested in making inquiries and a paper summary has also been published. The paper edition is intended to be a quick reference file for the most common questions.